It's not nice to be cruel about it's licensing policy. 2000 transactions is pretty enough for a home user. Even you exceed (I didnt tried but it writes like that) only the automatic backup is disabled. So if you are a company (commercial usage) and also you want to keep your tons of transactions safe with auto backup, demading to continue as free even without a donation is not fair. @rogerthedodger: As the description states: "if the user exceeds 2000 transactions (credits, debits or transfers), the automatic backup of the database is disabled. A donation to the author will restore this function." So, the number of transactions is not limited in any way. The automatic backup (a secondary function) is what become disabled after 2000 transactions. This app really really rocks !!! There are tons of aplications like this. Even web based but I was looking for 5 things which I couldnt find together. 1. Light and non bloating application which can work over it's folder. I hate apps registering tons of pieces DLL's registry records. After they become sensetive to the system failures. For me for a safe record, a plain app is needed. 3. A cascaded filter in capacity like excel. (eg. filter x bank, after the second filter will filter under it's results...) So I can see A persons trancastions about B topic which transact over C bank with currency D !!! Now I'm still on detailed simulations, seems really promising. As I understood, only automatic backup of database is disabled if you exceed 2000 transactions, otherwise it works fine. RQ Money is @V2.05. The code was re-written and new features added. License is still freeware but with 2000 transactions limitation. To unlock... donation is required. If I am managing my own account, why the system insists that I have to key in the "person" field. It is annoying to type "myself" everytime. Can you make that field optional? That is, the system will proceed with or without that field. I am sorry, you have problems with language(s). I will try to improve it in the next version(s). If program crashes on start, try to correct unzip all files to new folder (with full rights for reading and writing). RQ Money is absolutely pure. Without any virus, trojan horse, or other dirty things. I know it, because I am an author of program. I use my original name on my webpages (where is contact). I quote a sentence right from this site: "Note that false positives (i.e. flagging a virus when there is actually none) are extremely common for virus scanners." the website says the program doesn't contain malware, but virustotal does not agree. DOESN'T WORK. LANGUAGE DROP DOWN IS BLANK AND NO WAY TO ENTER LANG OR DO ANYTHING PAST THAT. DELETED IT AFTER TWO TRIES. As I evaluate many freeware program like this. RQMONEY is the best of all. (it does say that is the best account program but best of competitor). It is size small, easy to use, support basic report and can export data. If it can import data from other source will be better. One problem I found is if you backup data in the same directory, data will all lost and cannot recover. Make such setup other backup directory. In version 1.3 the popup selection menu in the entry sceen may be not work right. First point is the summary report will show all the summary figure even I filter the record. Second point is it cannot show all record with all currency but only one currency. At last I want to say again. This is the best program for me to handle my account. It can not fully handle chinese character. The summary report contain all account even filter to one account/currency. But it is a very easy and light to use program. Last version was in spanish also. Why in this new version, spanish language was eliminated? 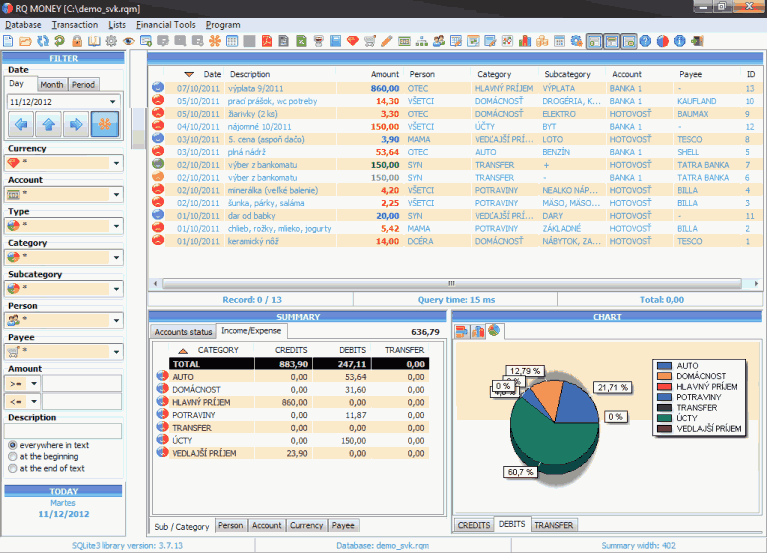 Rq money is free financial programme for operating systeme ms windows. Rq money can be used in daily life for evidence of credits and debits in household, viewing the course of auctions and investments or financial control of firm task. In the English lang every time trying to open a database file the program crashes. Unusable.